Over at M.A.G. Challenge By The Page, they have a weekly challenge that features ONE specific page from ONE specific cartridge -- The twist is that you cannot use ANY cuts from ANY other page or cartridge to complete your project -- This twist makes it SO MUCH FUN (even if it does get a little difficult). 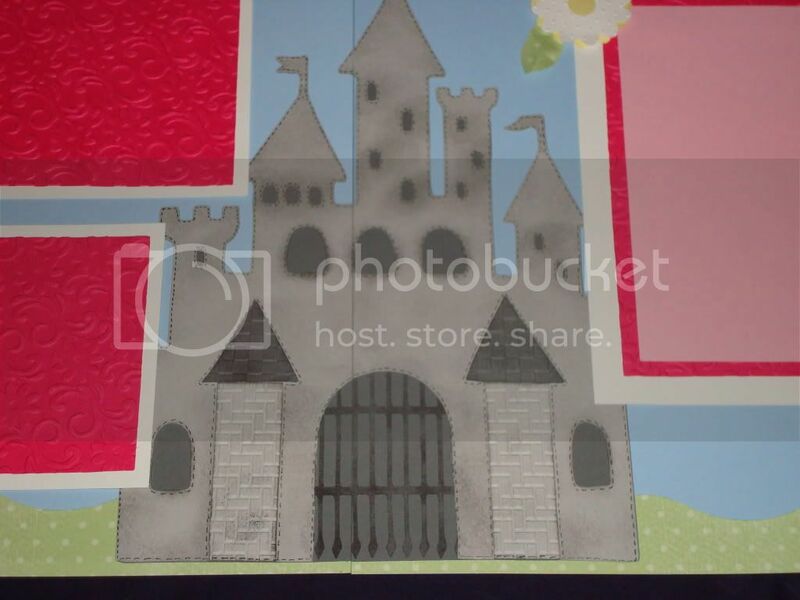 You can use any other embellishments as long as you don't cut anything else with your Cricut. 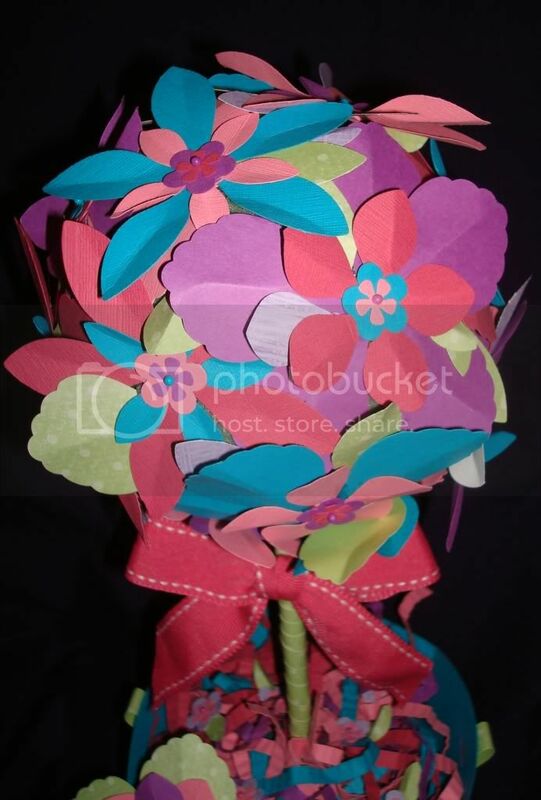 Well, as soon as I saw that we were using page 130 from Tags, Bags, Boxes and More, I just KNEW that I wanted to create a Flower Topiary with that little nut cup!! I had planned to punch ALL of the flowers with my little tiny flower punches from Creative Memories (see those two tiny little flowers in the center of all the other ones???)... Well, thank goodness for BFFs, cuz Christi insisted that I'd have bruised fingers if I tried to punch one million flowers that way... And she loaned me her VERY COOL new Stampin Up! 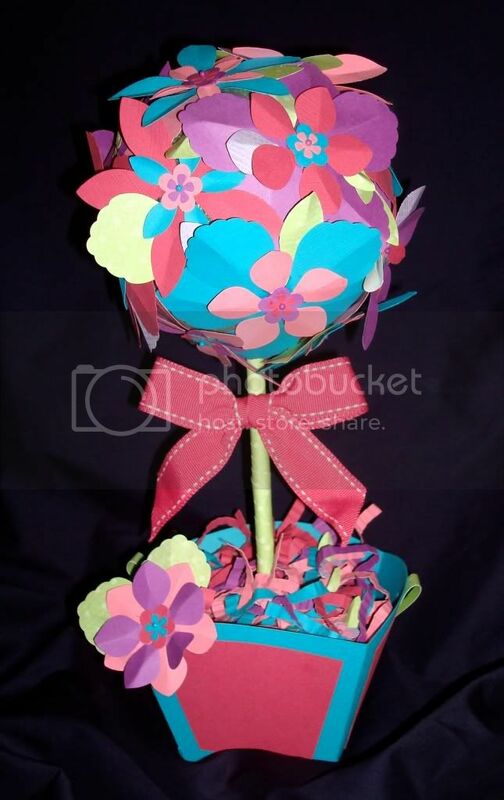 Blossom Petals XL Punch which allowed me to piece ALL of the flowers for my topiary!! I used a Styrofoam ball for the topiary top and pinned all of the flowers randomly to the ball... I think the pins might have been too thin (they are regular straight pins from the sewing department -- they just have pretty colors on the pinheads! 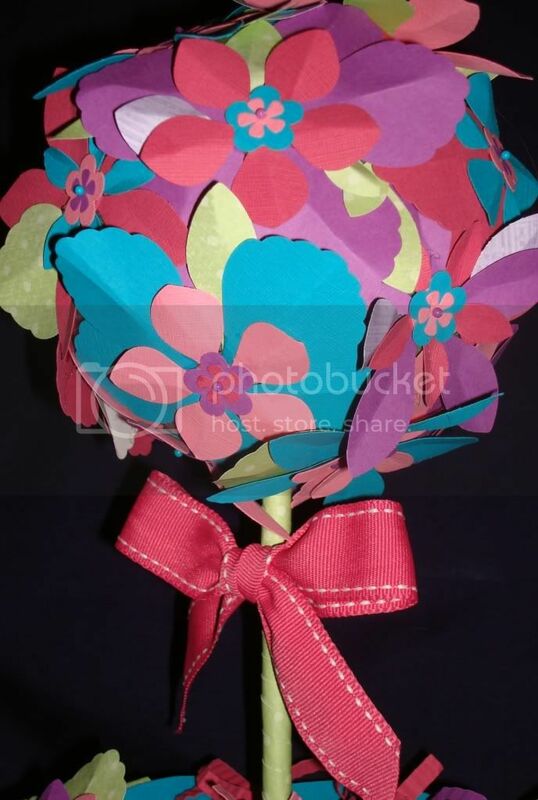 ), so I went back and hot glued all of the flowers down... So the pins are mostly decorative, but I like 'em!! I also used a Styrofoam square in the base of the topiary... 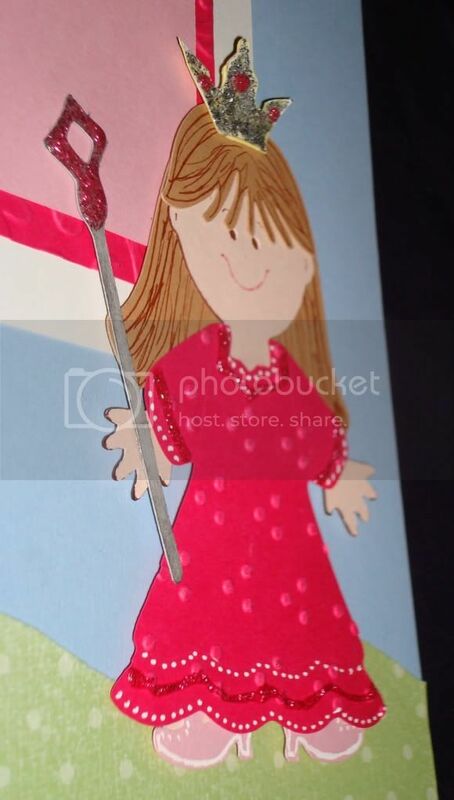 I then cut some 1/4" strips of paper and ran them through my paper crimper to fill the base... 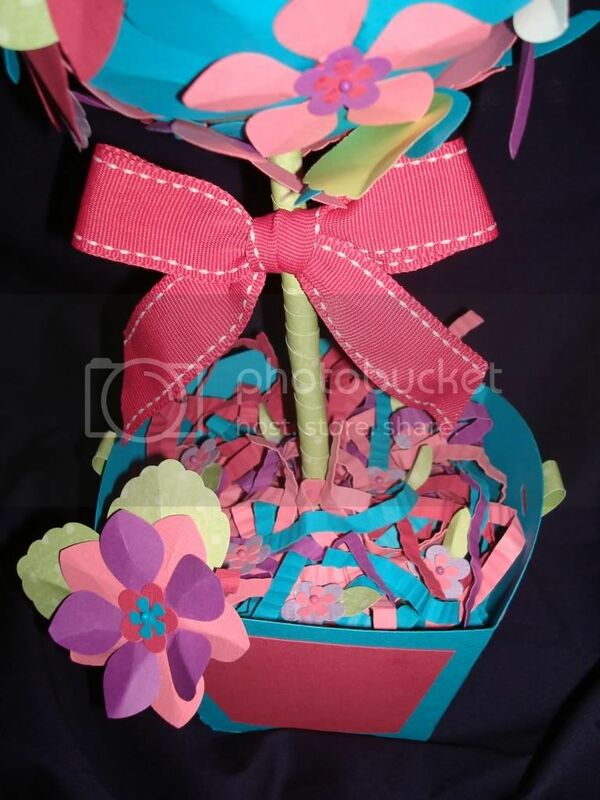 I added some of those little mini flower punches -- I pinned them into the Styrofoam to help 'control' the paper strips. 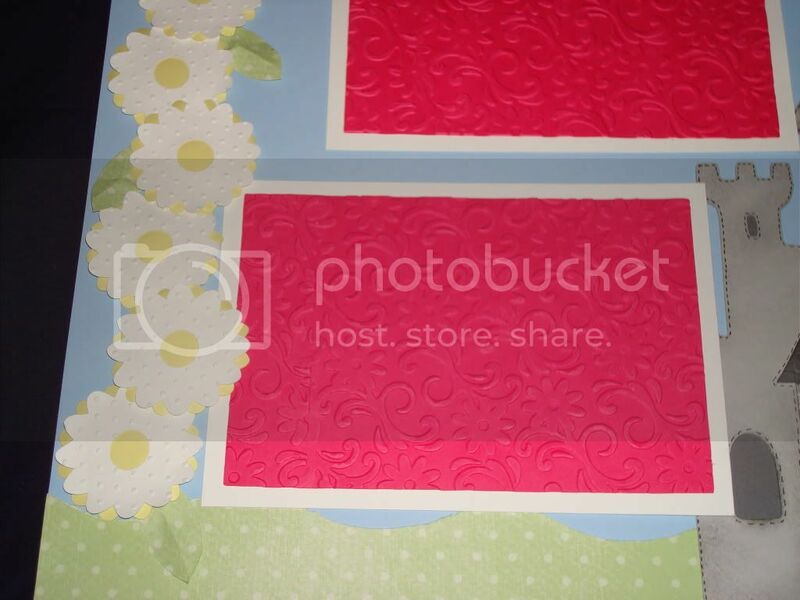 The final touch was the ribbon (also from Stampin Up!)... If you would like any more details on how to create a topiary like this one, please leave me a message and I will do my best to help!! 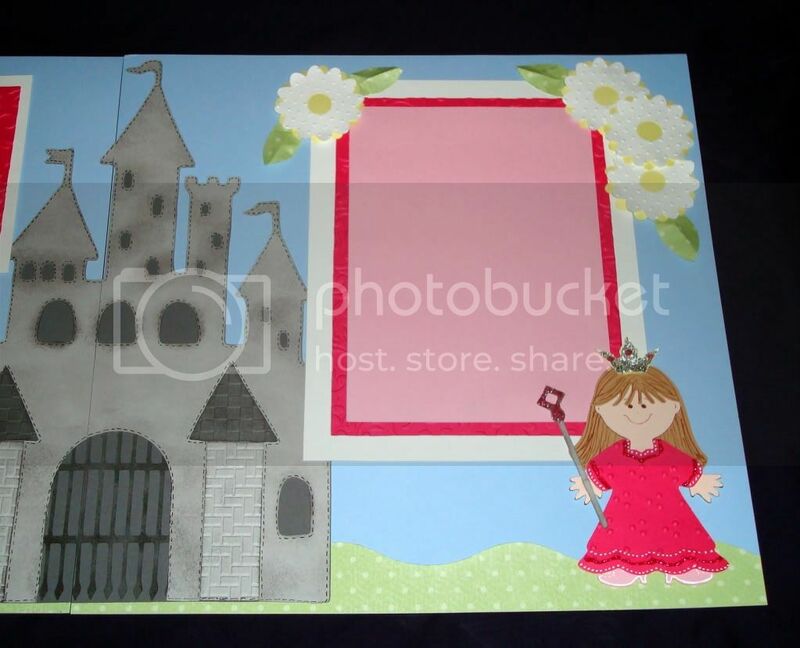 The entire paper doll as well as the castle can be found in Paper Doll Dress Up... (I'll be featuring a Cartridge Exploration Class for this cartridge at my upcoming Winter Scrapbooking Retreat in Western Pennsylvania, so if you're in the area, you can find all the details HERE...). 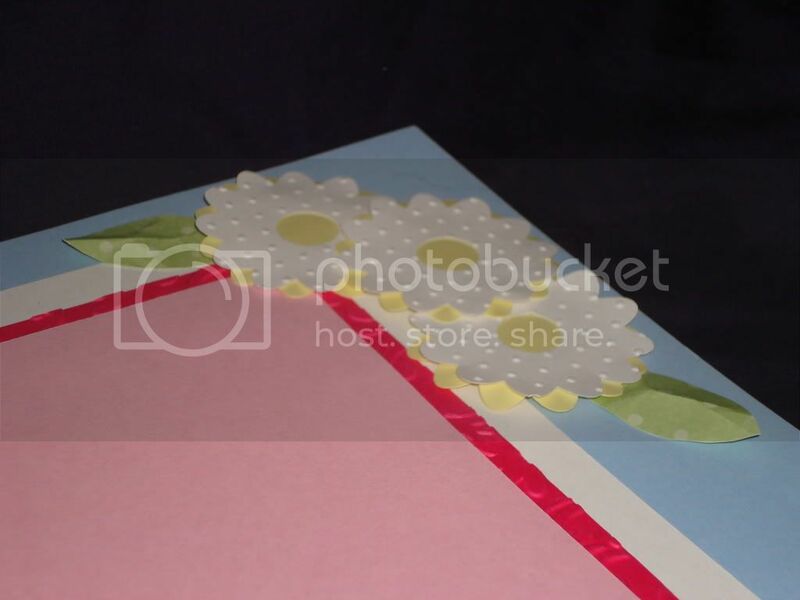 These simple flowers can be found on the Daisy Chain Cartridge... I used my Gypsy to cut the yellow flowers by using the 'hide contour' feature -- This allowed me to create a blackout for the flower too. Curling the edges of the flowers and embossing them with my Cuttlebug Swiss Dots folder adds dimension (and I L-O-V-E dimensional flowers!). I hope you enjoy my Princess layout!! Please be sure to leave a comment and let me know you were here... I'd also love for you to become a follower, if you're not already... Let me know if you sign up to follow -- I'd love to see what you're creating too!! To see all of my current creations, please CLICK HERE! 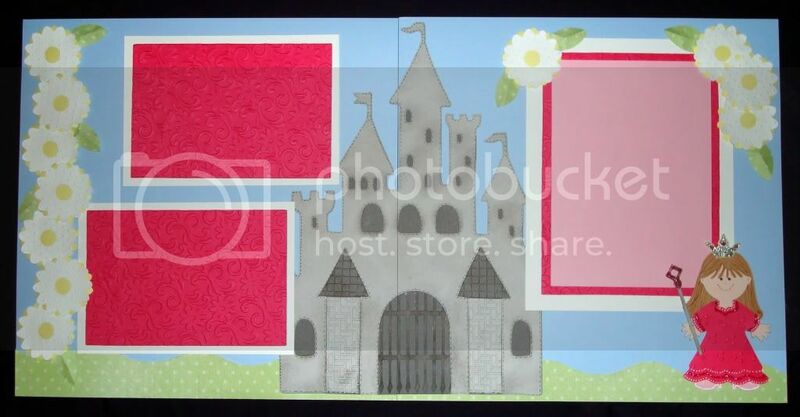 Such a darling LO:) Love how you split the castle on the LO!! TFS and thanks for joining us at Cooking With Cricut this week. 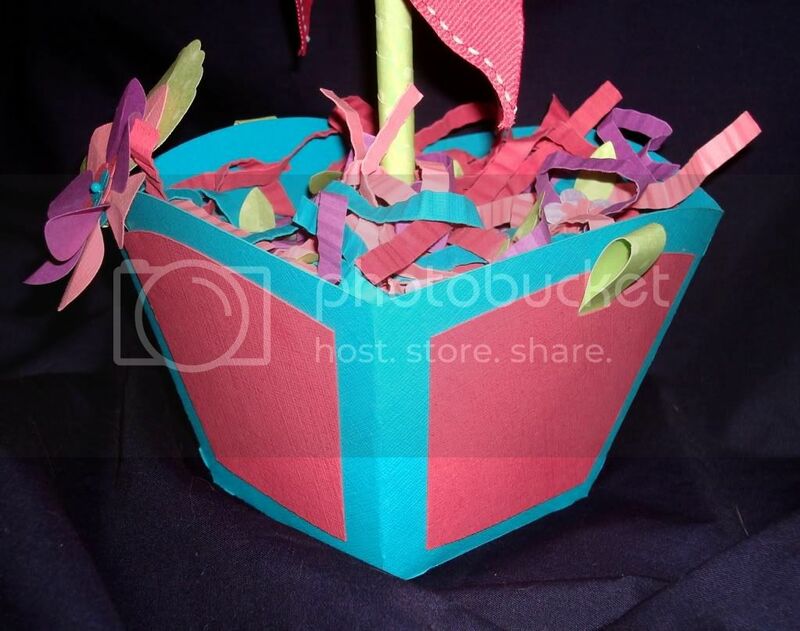 Absolutely fantastic, you did such a great job on all the projects and I just love your nut cup, it's just perfect for the challenge, thanks so much for joining with us at M.A.G. Challenge! Your LO is absolutely beautiful!!! Love everything about it. Great projects! Thanks for playing along with us at Cooking with the Cricut. Thanks for playing with us this week at Cooking with Cricut. Good luck with our challenge ! WOW! SO darling. Your projects are super sweet. I love your princess layout. Awesome work! WOW, Amy! Both projects are amazing! Thanks so much for sharing your LO with us this week at Cooking With Cricut. OMG! You out did yourself with this topiary! LOVE LOVE!!!! Wow, what great projects!!! The topiary is beautiful. I am now your newest follower. Great projects - both of them, but I really like the Topiary reminds me of Spring! Thanks for playing this week at PCC! Super cute projects!! Good luck on the challenge! Love them! I love your little floral tree...darling! Great Mothers Day centerpiece! Your Topiary is so Stinkin Adorable!! TFS!!! And thank you for all the chances to win from the mothers Day Hop!! what a cute topiary! and so colorful! I really like the layout, too.